Everton and Douglas Costa miss their penalties as Brazil are sent out of Copa America following a penalty shootout loss to Paraguay. 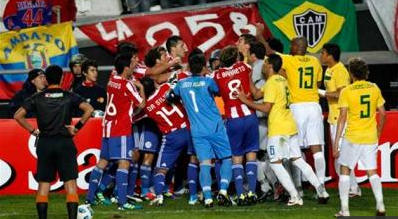 Paraguay beat Brazil 4-3 in a penalty shootout after a 1-1 draw on Saturday to advance to the semi-finals of the Copa America.The shootout delivered justice in the end, as the Selecao hardly showed anything that warranted a result from this match. Paraguay had more desire, more determination and now, they will face Argentina in the semi-finals. Robinho put Brazil ahead after 15 minutes,Brazil had looked to be heading towards that mouthwatering tie with Lionel Messi's side after Robinho's goal on 14 minutes, but Derlis Gonzalez's penalty midway through the second half ensured normal time finished 1-1 and took the game to penalties.Everton Ribeiro and Douglas Costa both missed from the spot as the Selecao suffered a repeat of their shoot-out loss to the same nation at the same stage four years ago.